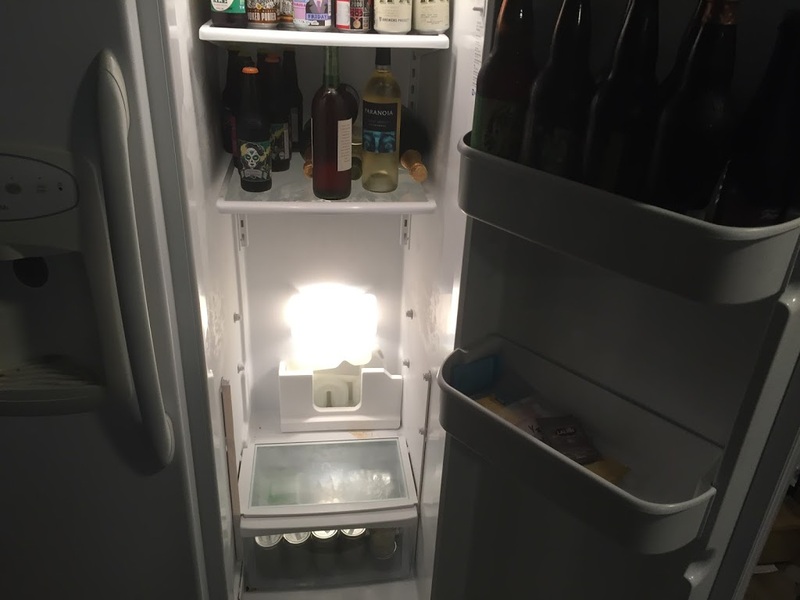 I currently have a “Beer Fridge” and would like to convert it to a Kegerator. 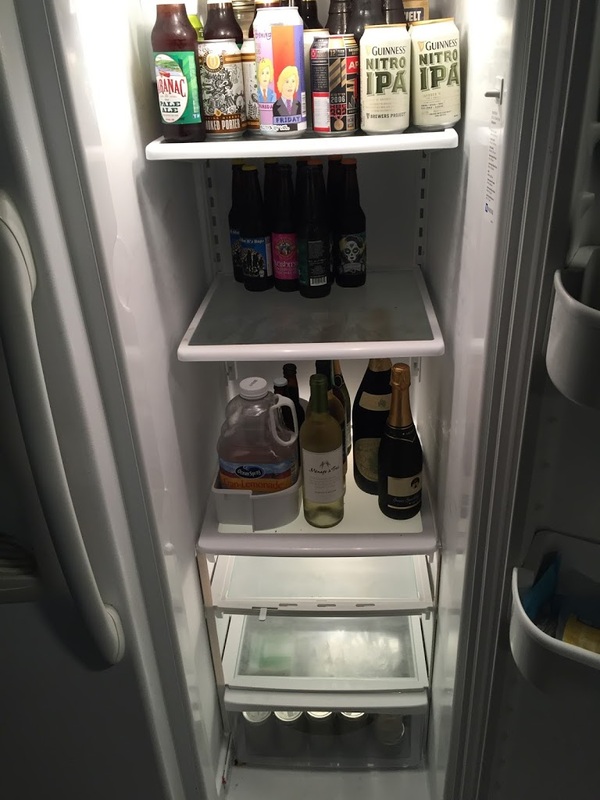 The thing is….it’s a side-by-side refrigerator. In this conversion, I will have to keep the temperature controls intact so the freezer can still be used as a freezer. Otherwise, it will be more than the conversion plans that get cut…OUCH! First step: Research. After that, research some more. Finally, I can research a bit more. 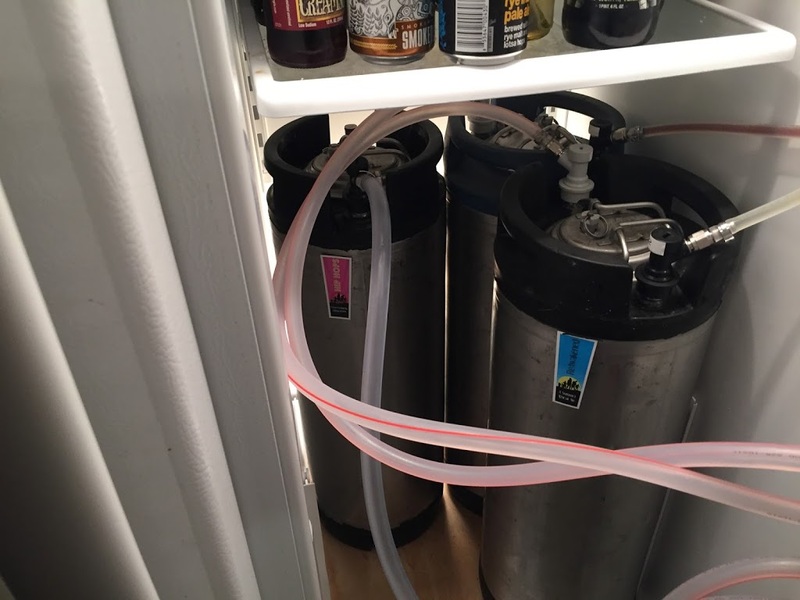 I knew that I wanted to attempt a 4 keg system in the fridge. 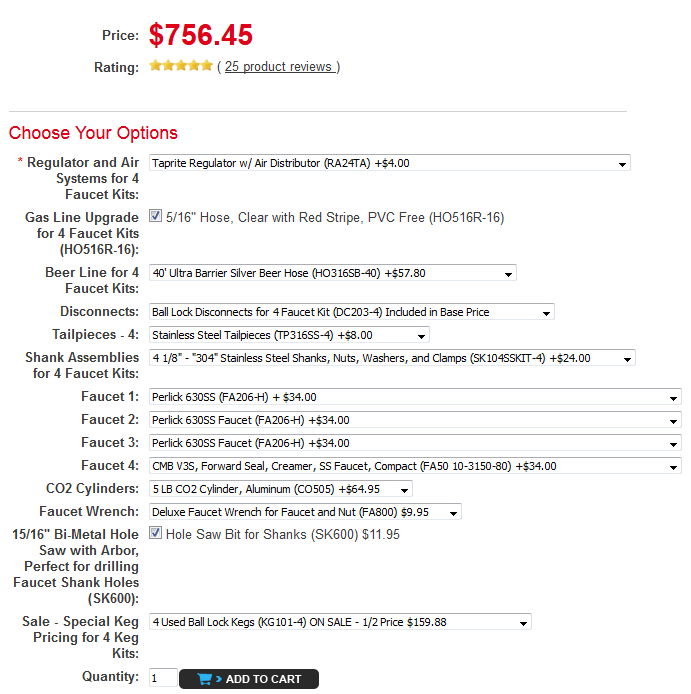 I was looking at Torpedo brand kegs, since they can be stacked with the fittings on and still serve beer. 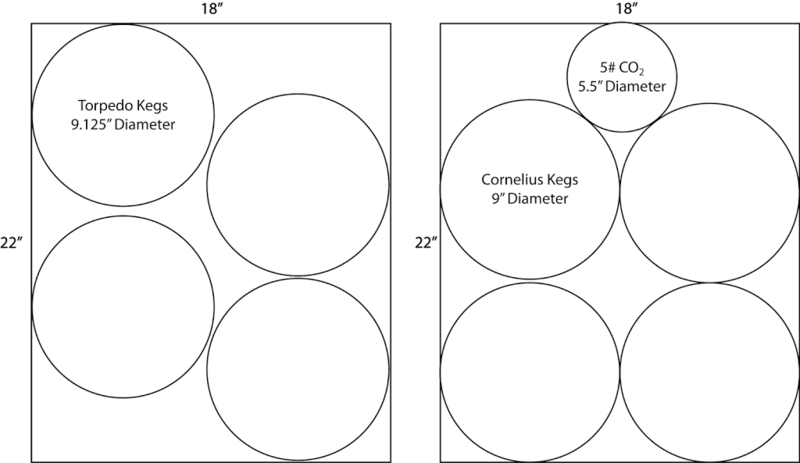 However, regular Cornelius Ball Lock kegs fit the bill a bit better. With that in mind, the next decision was the type(s) of faucets to be used. 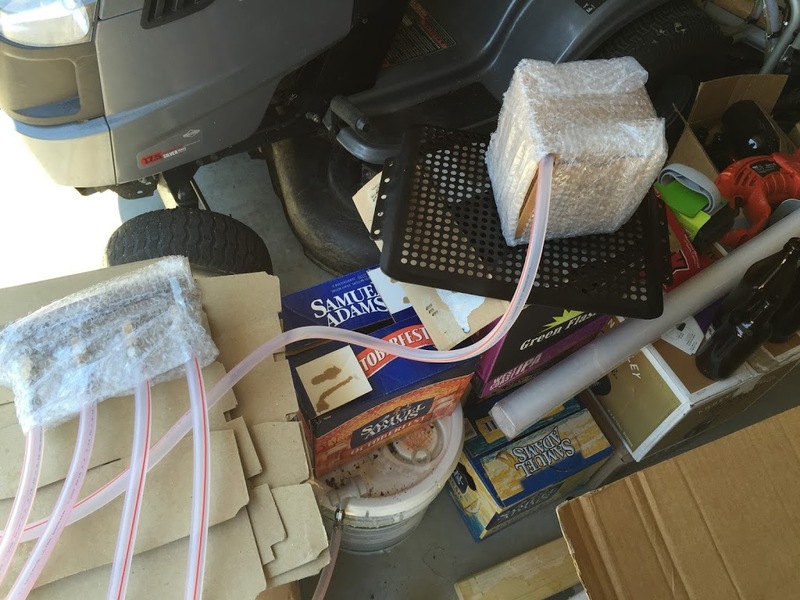 I knew Perlicks were the standard among home brewers, so I leaned that way. However, the next decision was where I hung a bit. 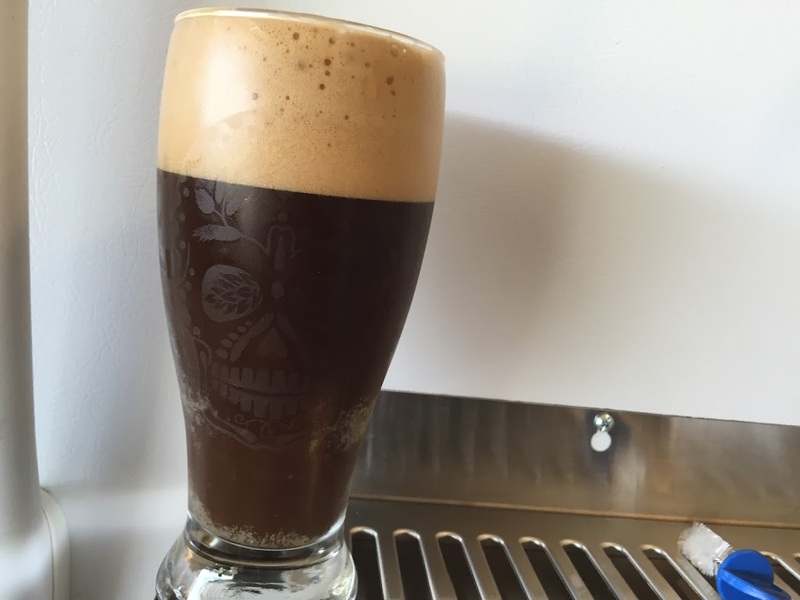 Did I want a stout faucet so I could dispense on nitro? Surely I did! Why wouldn’t I? 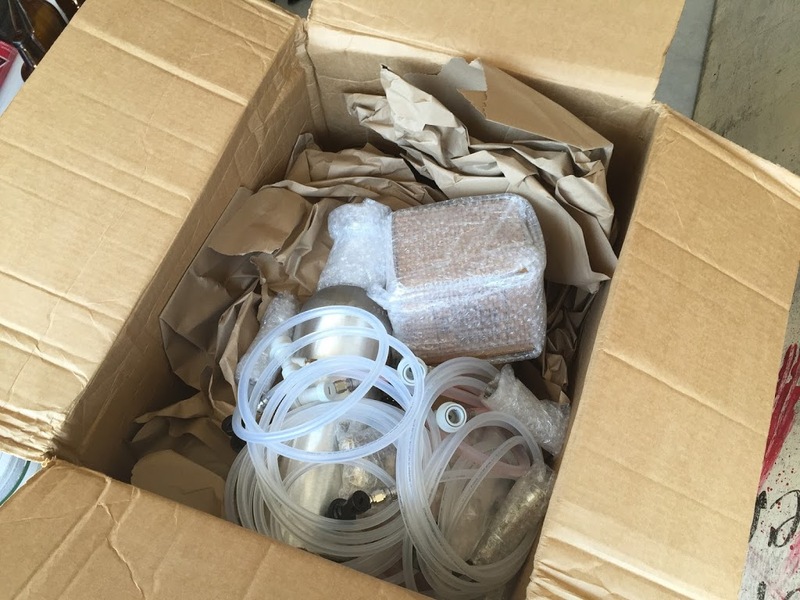 Well…because we don’t brew a lot of beers that would benefit from a nitro setup. A couple stouts overall. Our Russian Imperial Stout is still going to be bottle conditioned. I ended up going with a CM Becker Creamer faucet. It’s still a forward sealing faucet, but it uses a closed piston system to seal instead of the ball in the Perlicks. Searching and searching for all the parts figuring out what I would need, I (of course) put together a new Amazon Wish List to track what I wanted for this build. I upgraded to the Premium Beer and Gas lines, Stainless tailpieces and shanks, 3 Perlick 630SS faucets and the CM Becker Creamer Faucet. 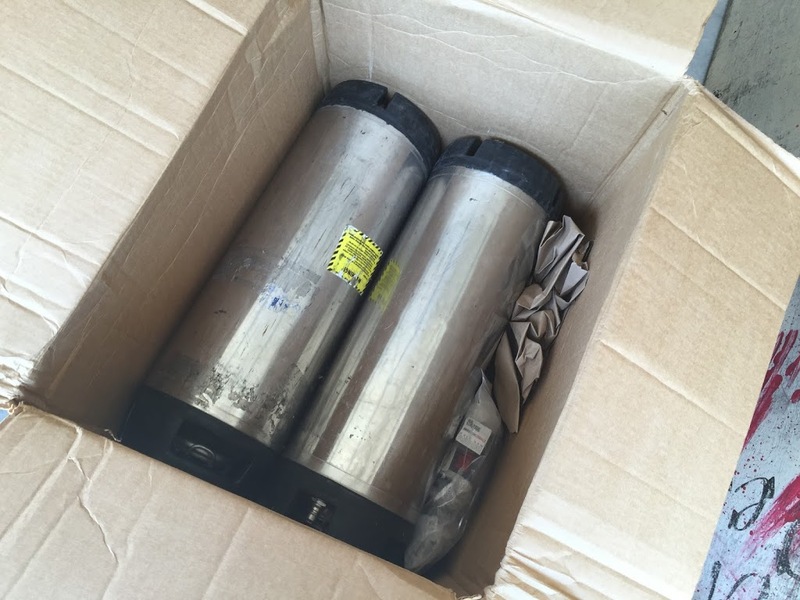 I also got the 5# CO2 tank and 4 Used Ball Lock Kegs. To finish it off, I opted for the Deluxe Faucet Wrench and the Hole Saw Bit for Shanks to help make the installation process easier. 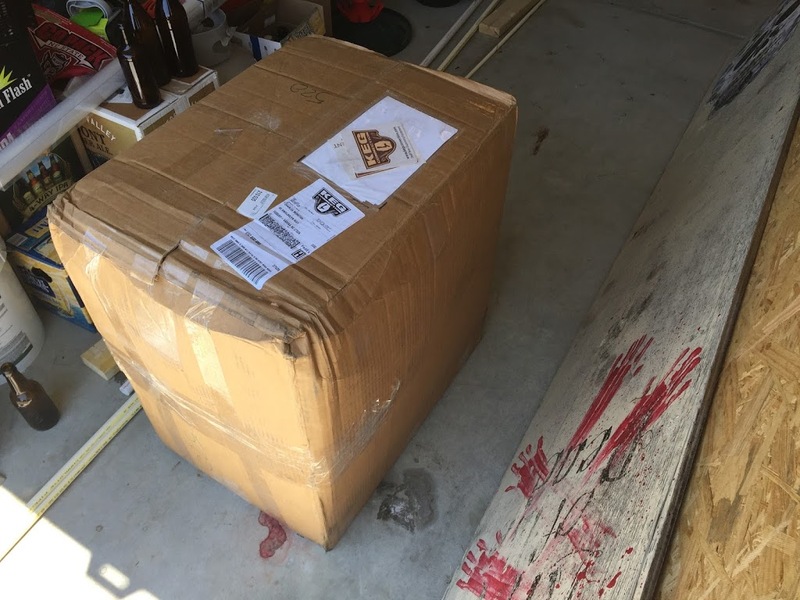 Shipping was a flat rate of $7.95. FOR EVERYTHING! I also ordered a Drip Tray. I figured that if I kept the floor clean, I wouldn’t have to endure any wrath. Then I went with faucet brushes to both keep the faucets clean and the fruit flies out. Delivery day! Surprisingly (and much to the chagrin of the FedEx driver) everything was packed into one box. The box was beat up a bit. 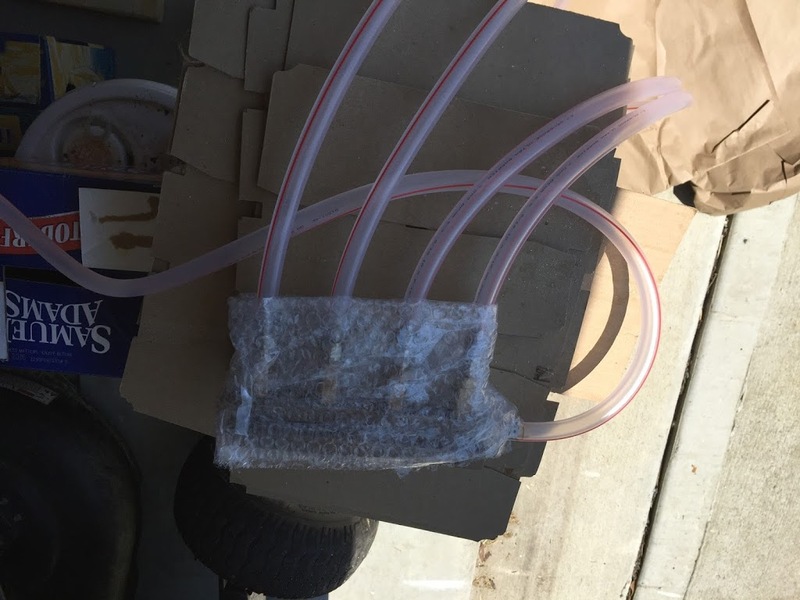 Upon opening the box and removing a layer of packing paper, the hoses are all coiled up. 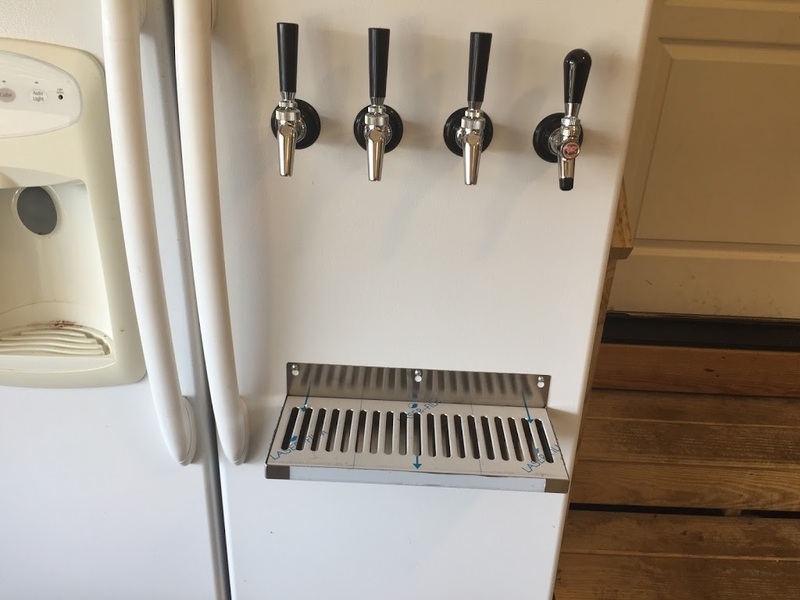 4 beer lines with their keg connectors and shanks connected. …and to the regulator. 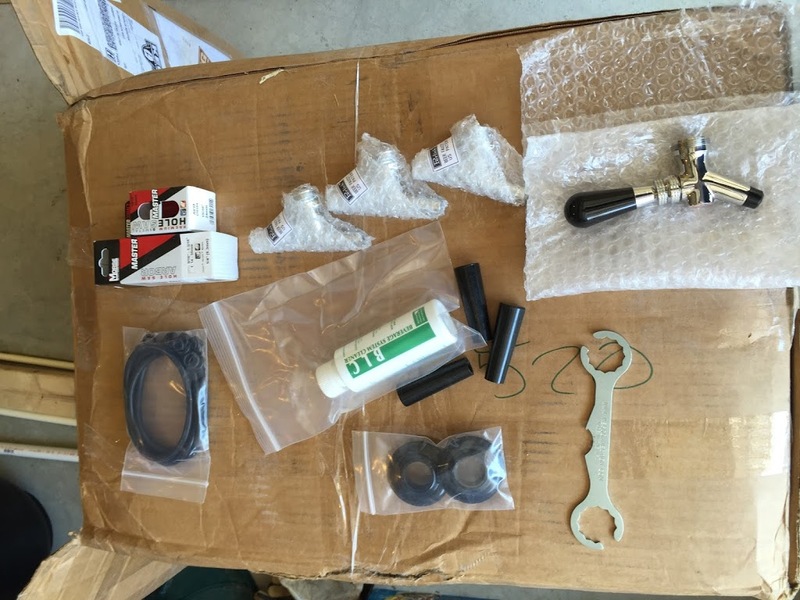 The regulator is in the box. Kegs! There are four of them in there. One of the kegs has some pretty grimy posts. 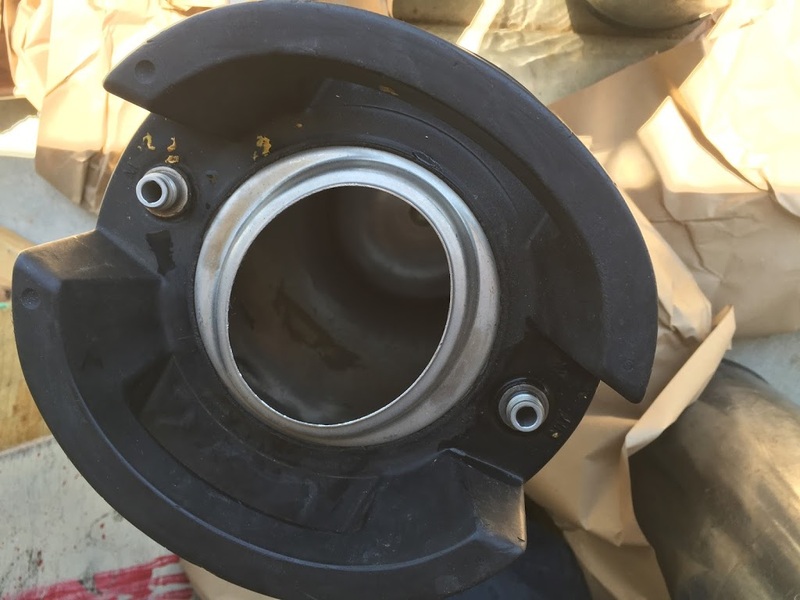 Seems to be an adhesive or gasket material. You can see it around the post on the keg, too. Both posts on this one keg have it all over them. One last bag. 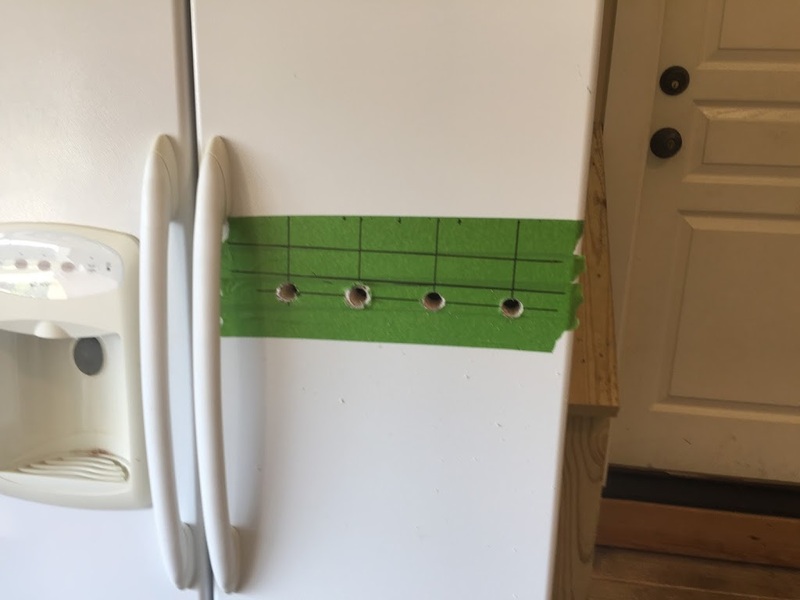 Hole saw and arbor for cutting into the refrigerator. These are at the top left. 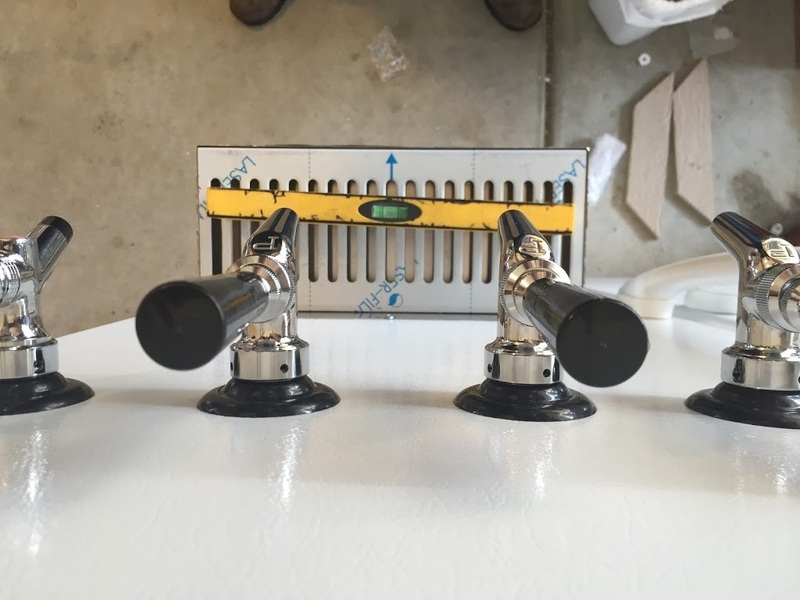 Going clockwise, there are three Perlick 630SS faucets, the CM Becker Creamer faucet, deluxe keg wrench, generic tap handles, faucet collars, Beer Line Cleaner, and finally, four new sets of O-Rings for the kegs. I didn’t know these were coming, so it was a nice surprise. Next step, disassemble the kegs and clean every single part. 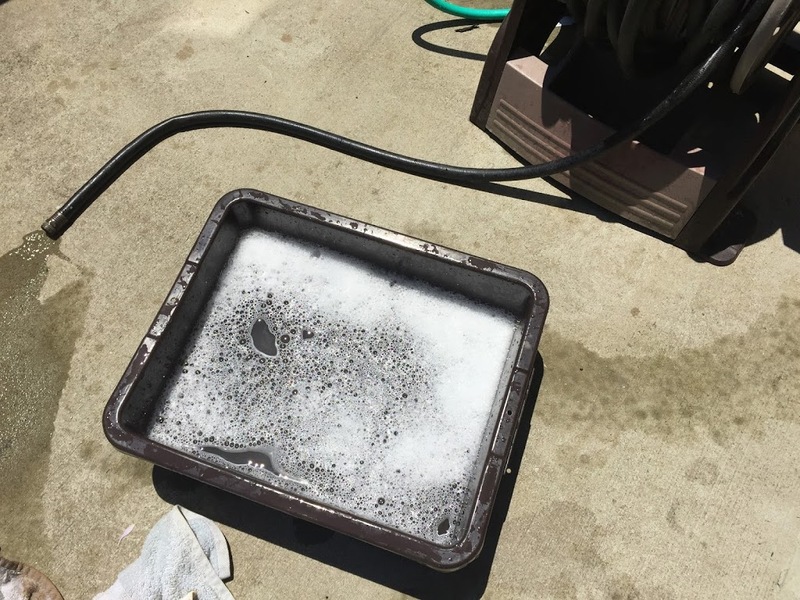 Cleaning solution in a bus tray. 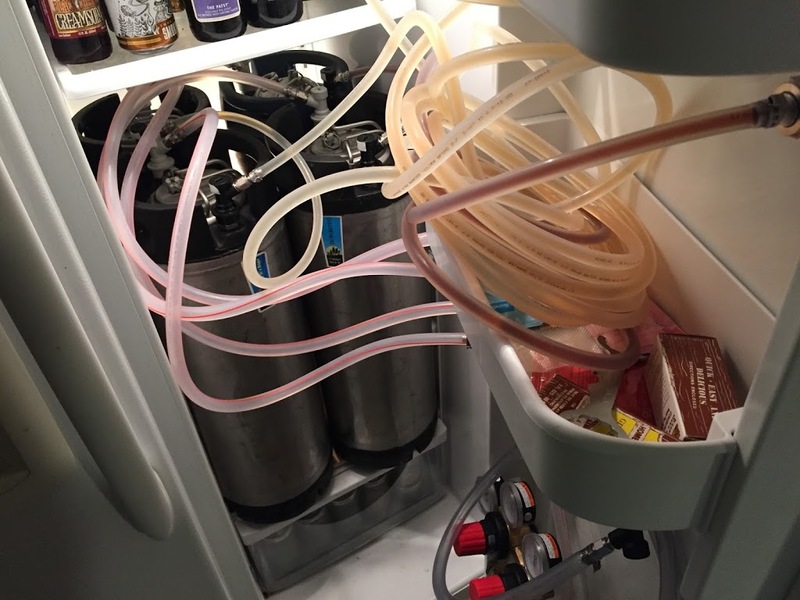 It’s almost long enough for the beer dip tube, but it works. I moved my bombers into the top door shelf since I will be able to keep that. My Dry Yeast is in the door shelf below the bombers. Removing the drawer assembly was quite simple. 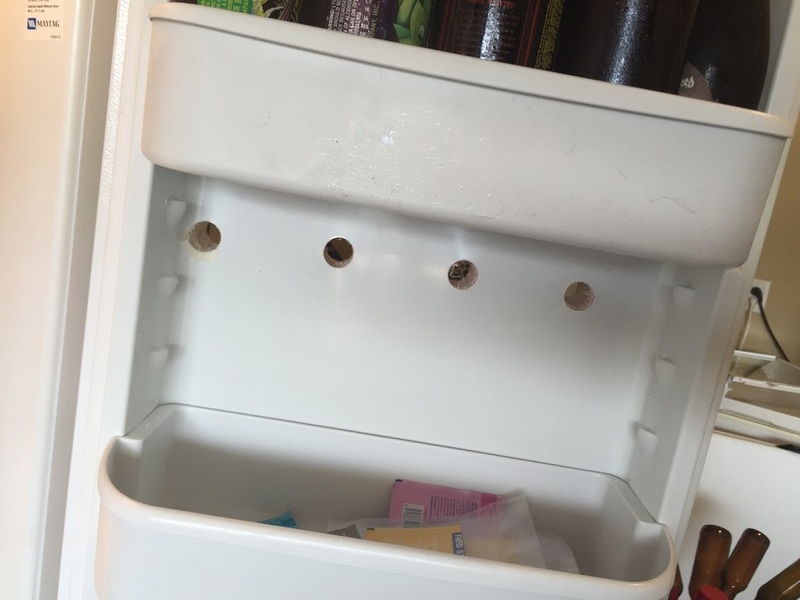 Remove the drawer, pull up on the top/shelf part and pull forward. Once the top two drawers were removed, I decided to keep the bottom drawer in place. The floor underneath is sloped and I would have to build an elevated floor if I decided to remove it. 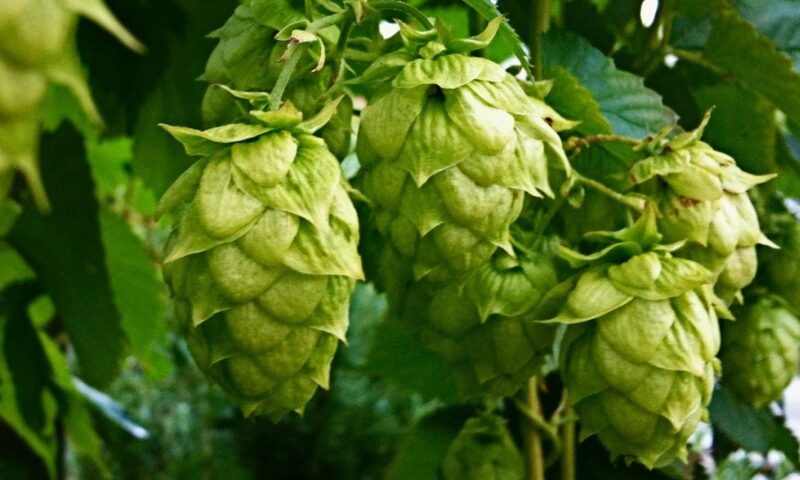 This way, I can still have my hops stored in here. 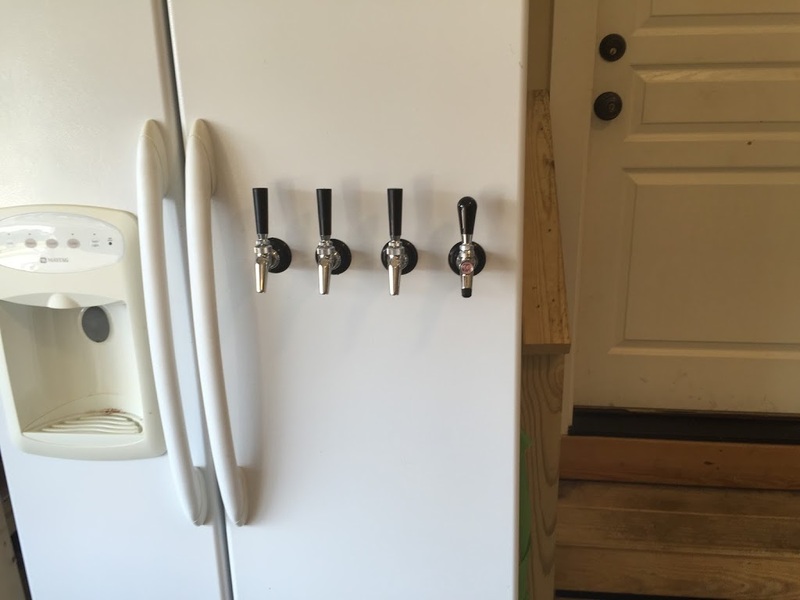 As you can see, though, there is an extra assembly for the refrigerator at the back of the “Keg Area”. 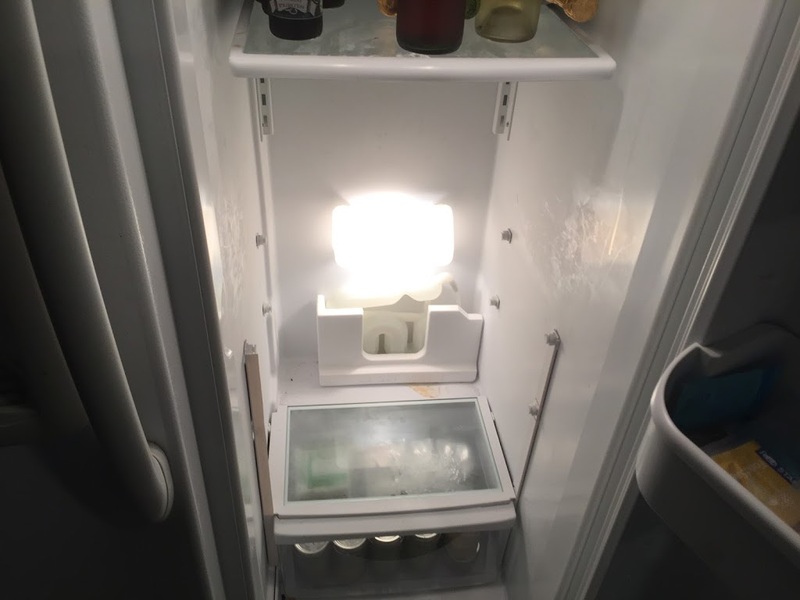 This is where the light is and the system to adjust the humidity in the vegetable drawer. This area was where I had planned to place the CO2 tank. Time to re-think the placement! Test fit of the four kegs, they all fit! I decided to see if I could mount the CO2 on the door. 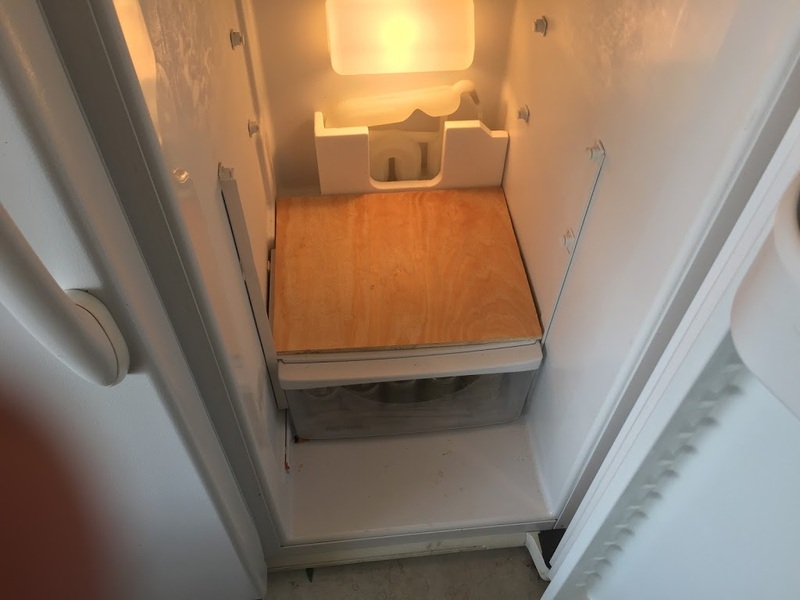 The way the door of this refrigerator is laid out, you lift out the trays and the whole interior of the door is then solid and smooth with a ledge at the bottom. I placed the CO2 tank on this ledge and tested the fit. 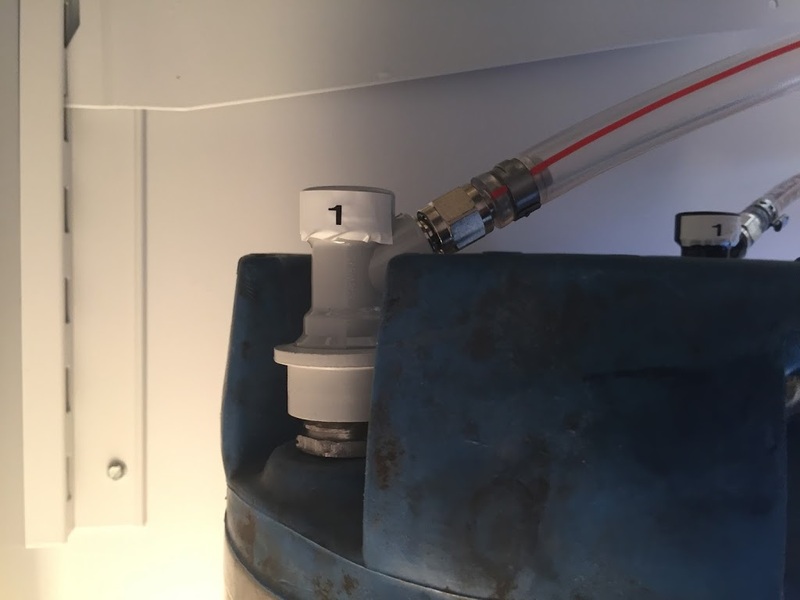 This is a shot of the door fully closed and sealed with the CO2 tank placed on the bottom of the door. 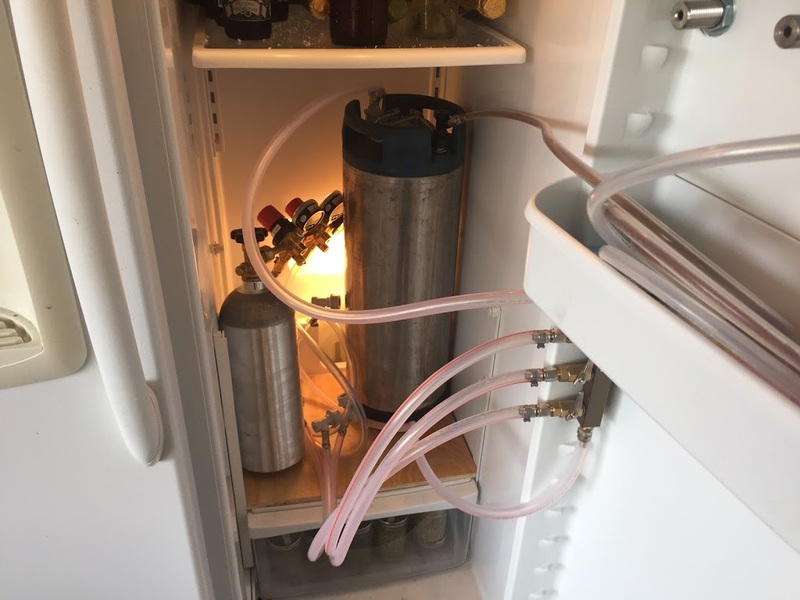 I need to build a restraining assembly to hold it in place, but I can definitely fit all 4 kegs and the CO2 tank. This layout gives me two usable shelves in the main refrigerator area as well as a drawer and two door shelves. I decided to put the shanks between the two door shelves, so I marked the location and taped up the outside working area on the door. I measured to find center between the inside edge of the door handle and the right side of the door. My drip tray is 14″ wide so I marked 7″ on each side of center. 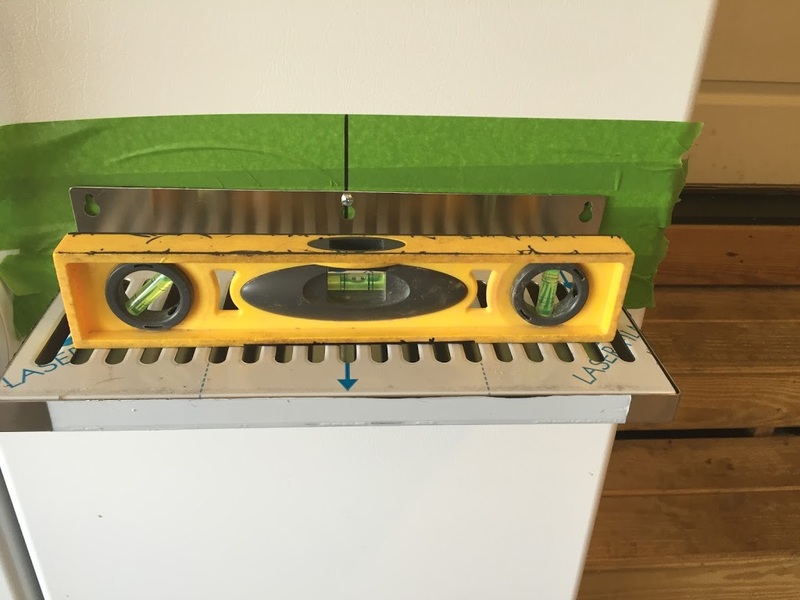 I wanted each outer faucet to be 1″ inside the edge of the drip tray, so I marked 6″ on each side of center, giving a 12″ span. I then marked 4″ in from the leftmost mark for the 12″ span and then twice more from each new mark, giving me 4 marks at 4″ apart within the allotted 12″. Once I had that, I marked the level at which I wanted the faucets and checked that with the interior of the door. I ended up going with the lowest mark you see. 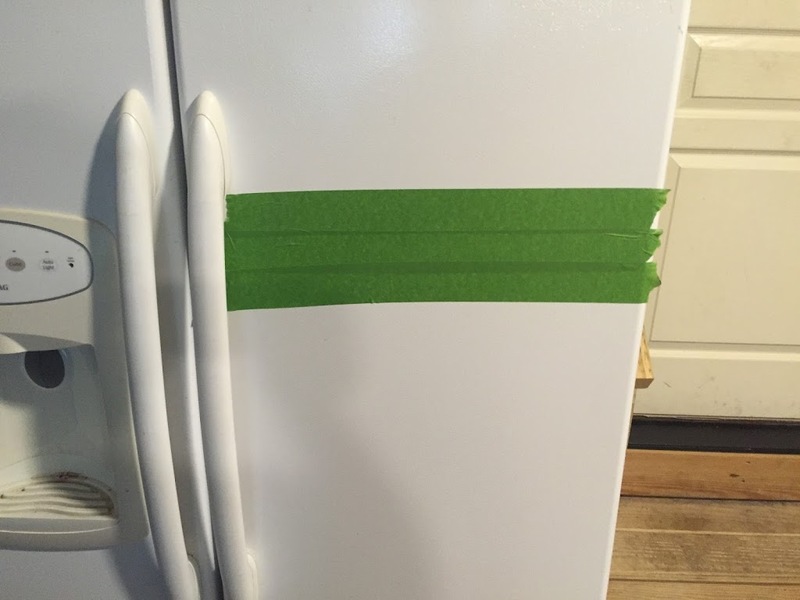 Don’t worry, the lines are level, the tape is not. 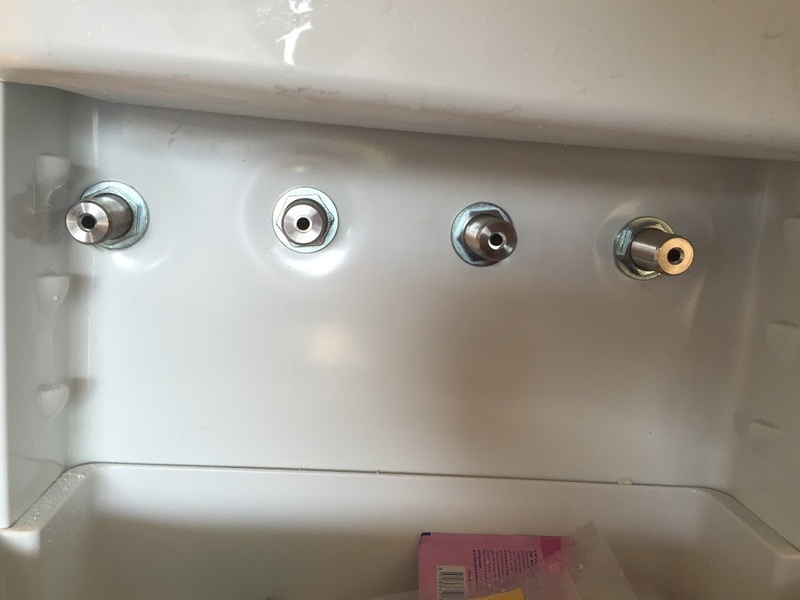 I used the hole saw that came with the equipment and quickly drilled the 4 holes for the faucet shanks. Inside view of the 4 holes. Nice, clean cuts. From there, inserting the shanks was easy. 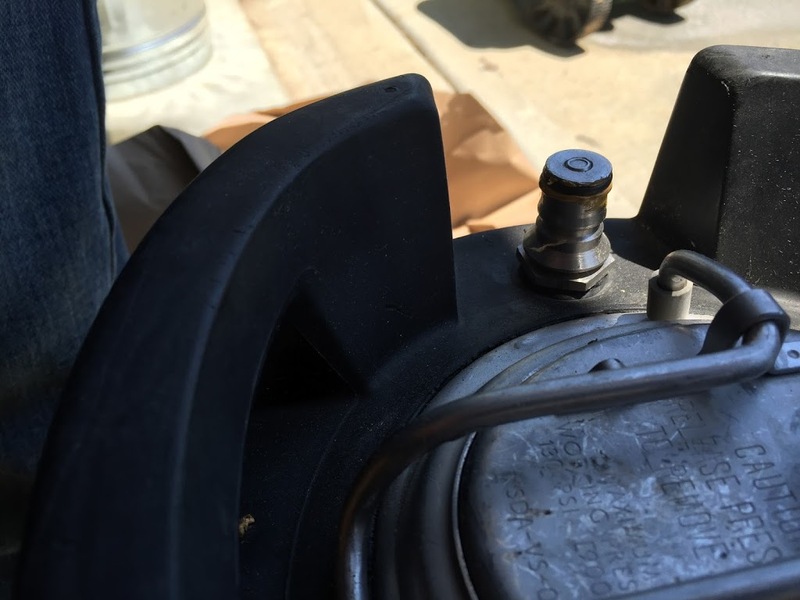 Since they shipped already attached to the beer line, I disconnected the tailpiece, removed the nut and slid on the black collar. I then screwed on the faucet and inserted the shank from the front. The wrench I got from the kit make tightening the faucet simple. Nuts and shanks in place. 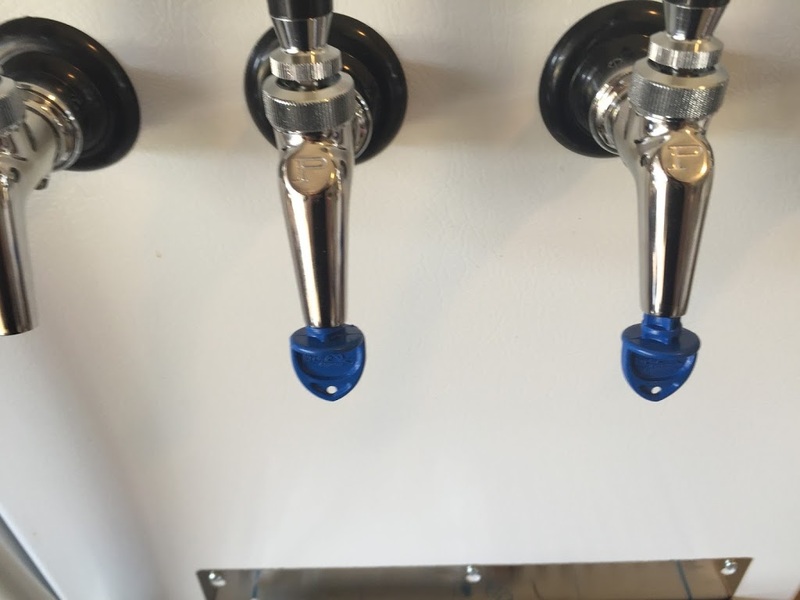 Temporary Tap Handles installed. They came with the kit. I then cut a piece of plywood to use as the floor for the kegs. I didn’t feel good about the kegs using glass as a floor, even though it was tempered. I ordered the single Taprite regulator because I already had a double. 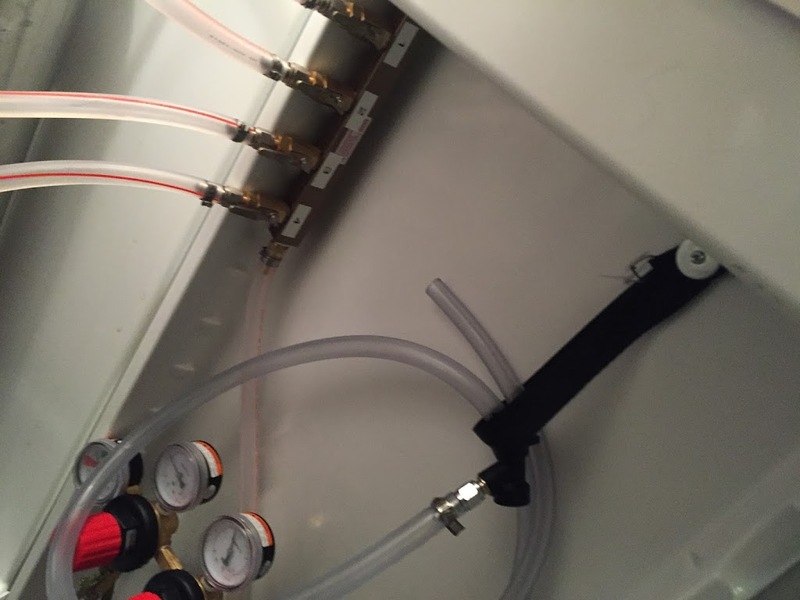 I disconnected the manifold from the single and connected it to the double. This will allow me to force carb at a higher pressure than the serving pressure. 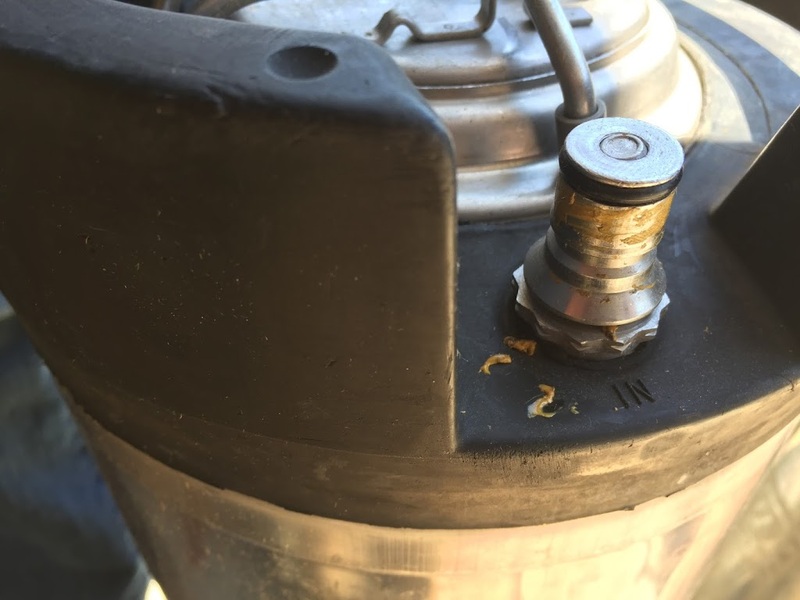 This was also the only place that a screw clamp was used by kegconnection, making this a very easy swap. 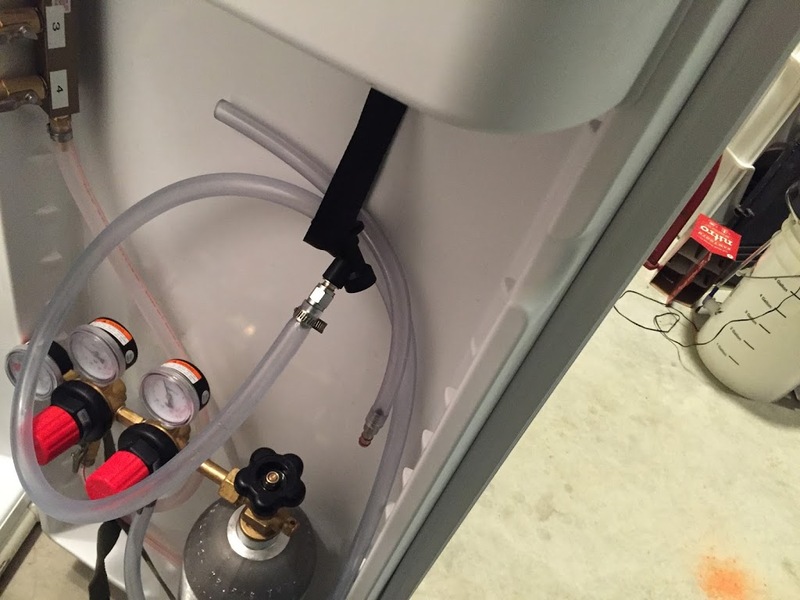 I decided to install the CO2 manifold sideways on the door to give maximum line length to the kegs. 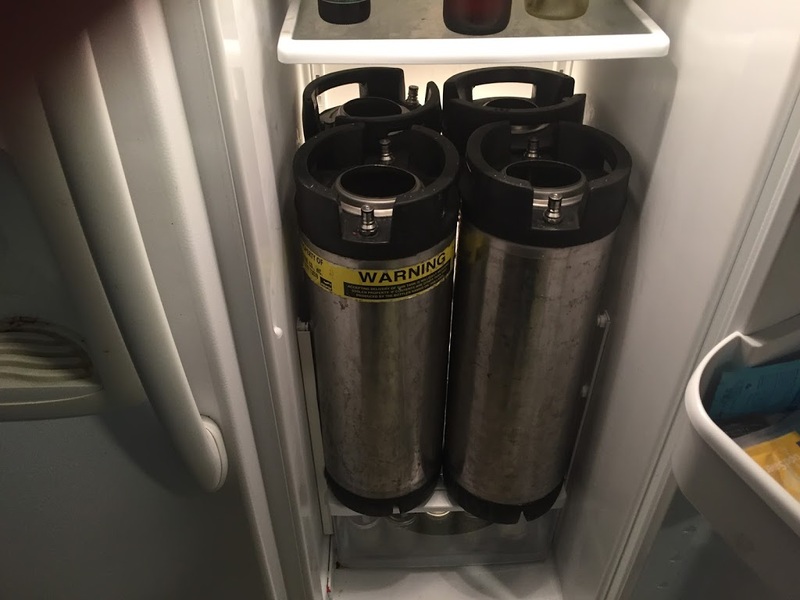 Since I had a keg that was pressurized and waiting, I placed it in the fridge to get to serving temp. 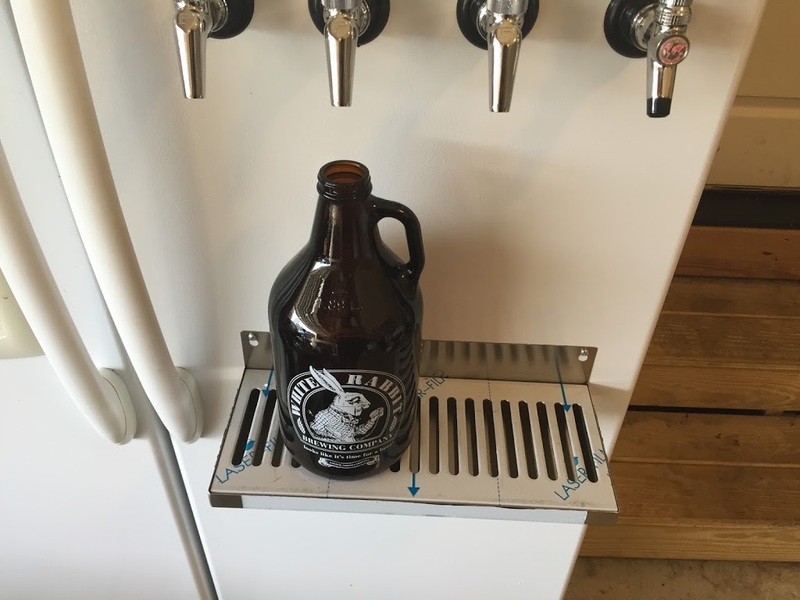 I wanted the drip tray to be able to hold a growler for fills. 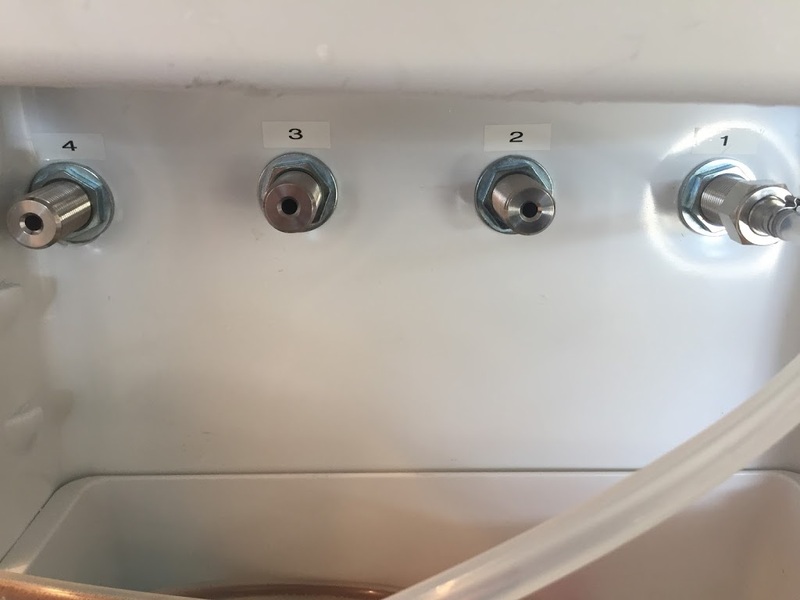 I put the growler filler in the leftmost faucet and held a growler to the level where the filler was at the bottom of the growler. 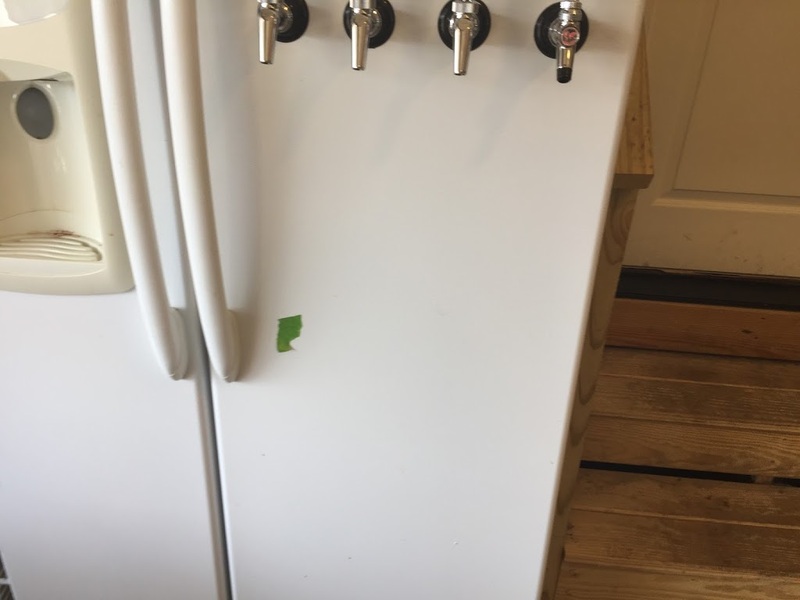 I marked this spot on the fridge with a piece of tape. Measured for center and level for the tray. 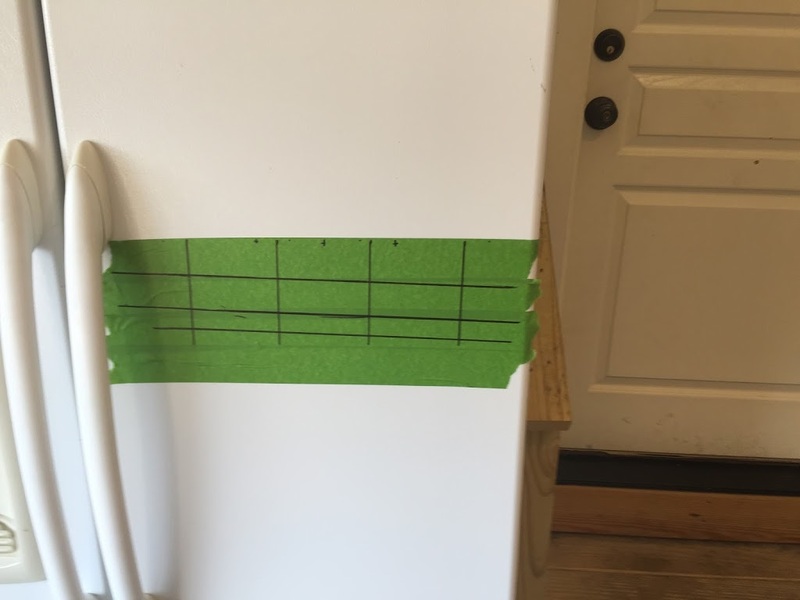 Placed the center screw, leveled the tray and marked for the two outer screws. Removed the tray, drilled for the outer screws and removed the tape. 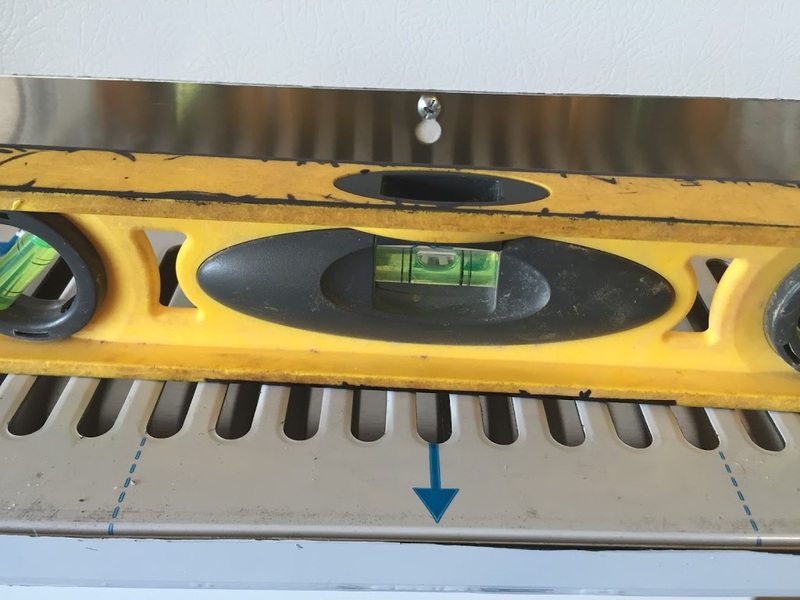 I then installed the Drip Tray, making sure it was level. Looks good from here! As you can see, the drip tray is deep enough to hold a growler without assistance. With that done, it was time to label everything. This will help out a LOT in the future. 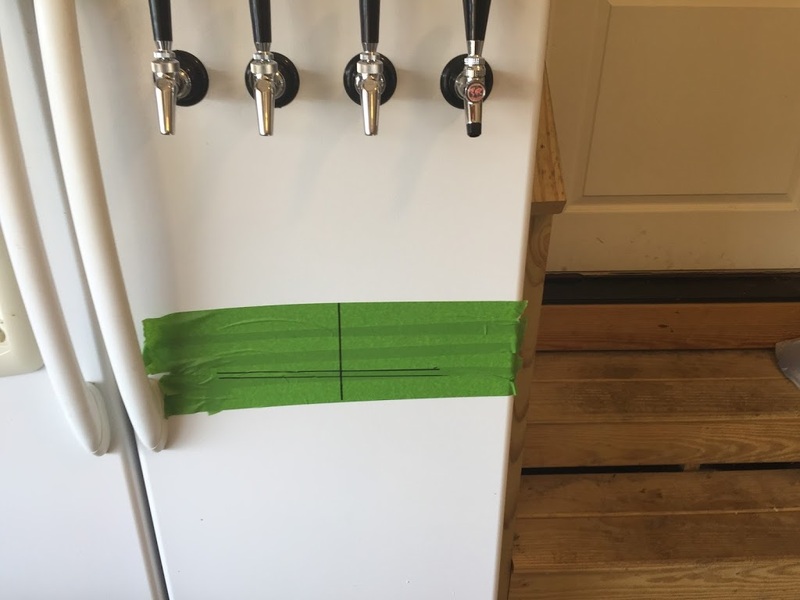 Nobody wants to trace beer lines when there are 4 kegs in this tight space. I labeled the faucets in reverse order so the leftmost faucet is number 1 from the outside. Then I labeled the manifold. And the Beer and Gas Lines. I got the faucet brushes from amazon to help keep the fruit flies out of the faucets and to help keep the faucets clean. The problem, though, is the faucet on the right. The brushes would not keep fruit flies out since there is a way in. Turns out the Perlick (and the CM Becker) faucets are narrower than others and these brushes do not fit flush. The faucet on the right will keep the fruit flies out because I have modified the brush to do so. 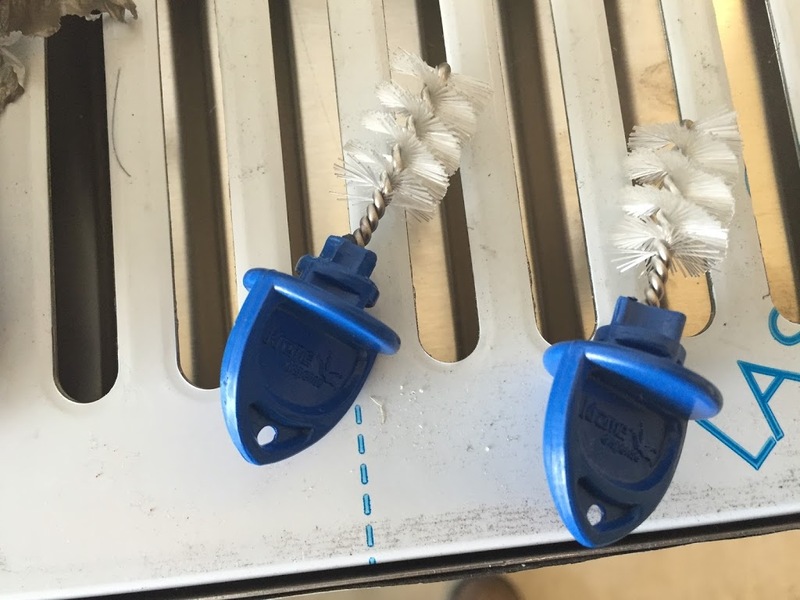 The left brush is modified, the right is not. There are 4 ‘ribs’ just below the brush and these are what keep the brush from inserting fully. By cutting these ribs back, you can insert the brush enough to seal and keep fruit flies out. Faucets, Drip Tray, and brushes installed. 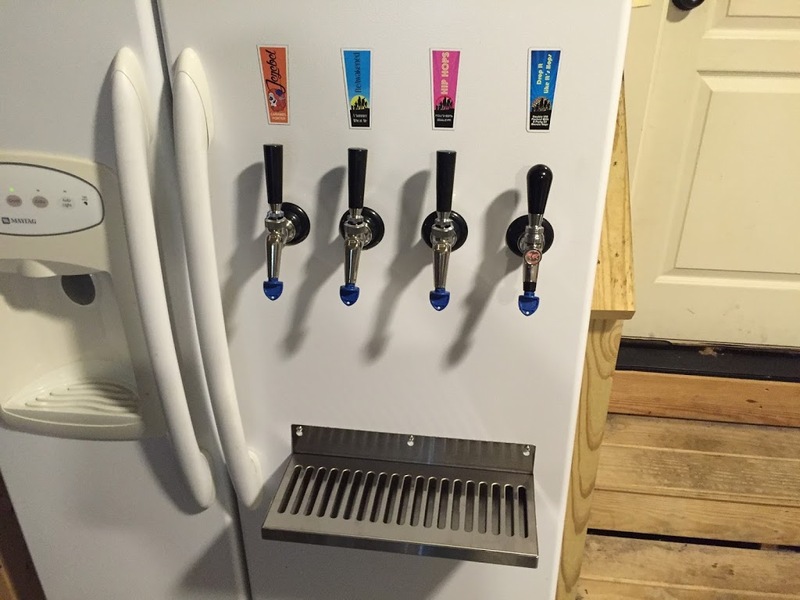 That’s a good looking kegerator! To mount the CO2 tank to the door, I used an old military cargo strap. I cut it down to size and used two fender washers to attach it to the interior of the door. 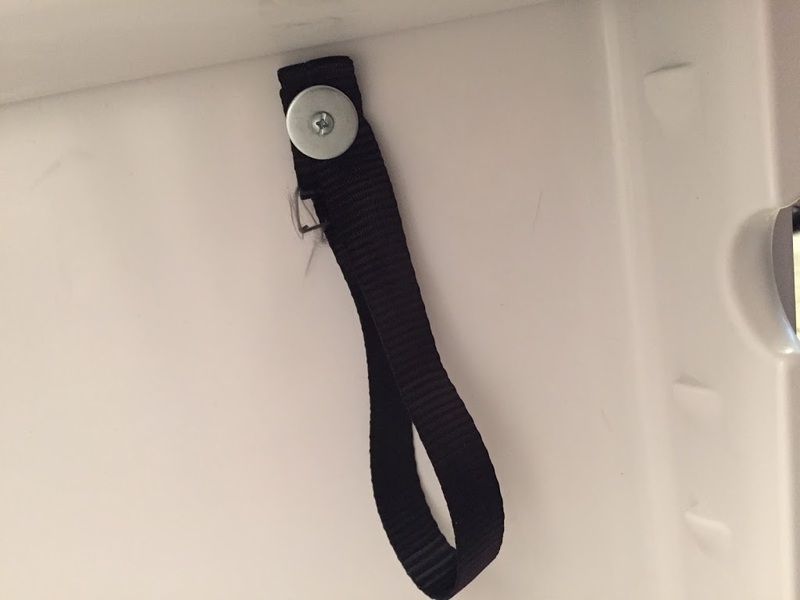 This strap can be loosened and tightened for when the tank needs to be refilled. 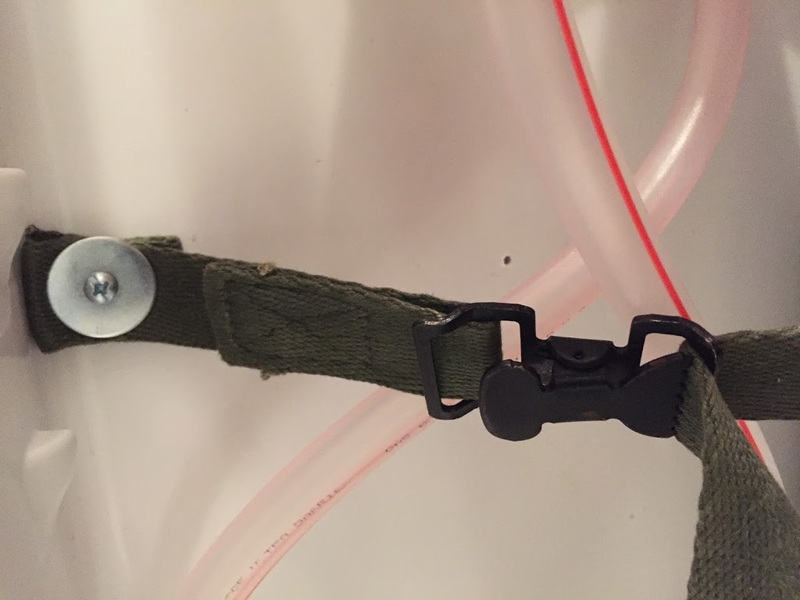 I also created a loop out of some more canvas strap so I can hang the Gas Line that is used for force carbonation when it is not being used. Here’s the force carb line hanging in the loop. 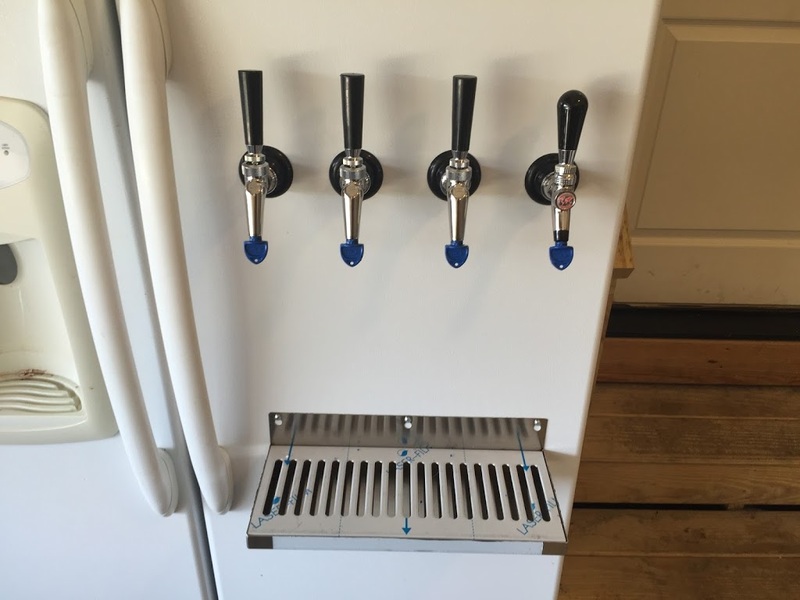 It’s also a handy place to store the growler filler. 2 kegs serving, 1 keg carbing. I force carb at 24 psi for three days through the liquid tube. 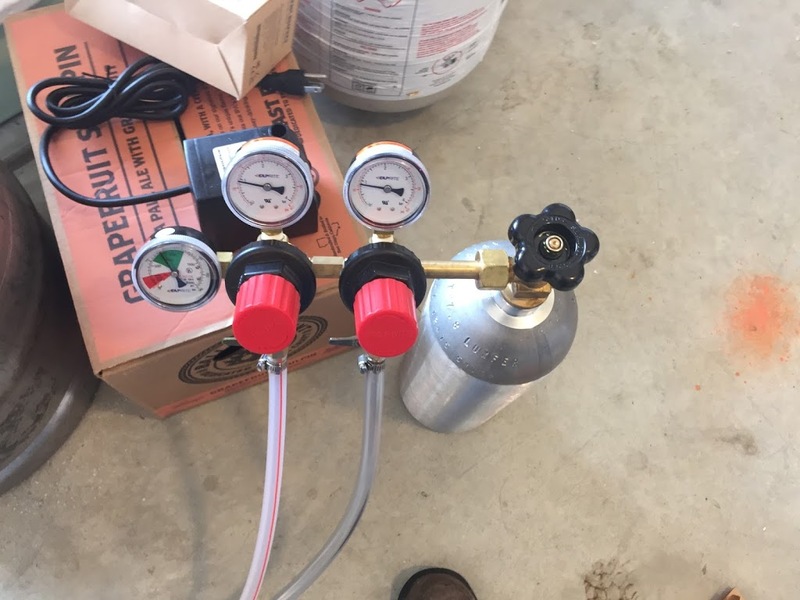 This ensures the CO2 passes through the beer and carbonates faster. I am serving at 11 psi. First pour! Jezebel is now on tap at Ales of the Dead! 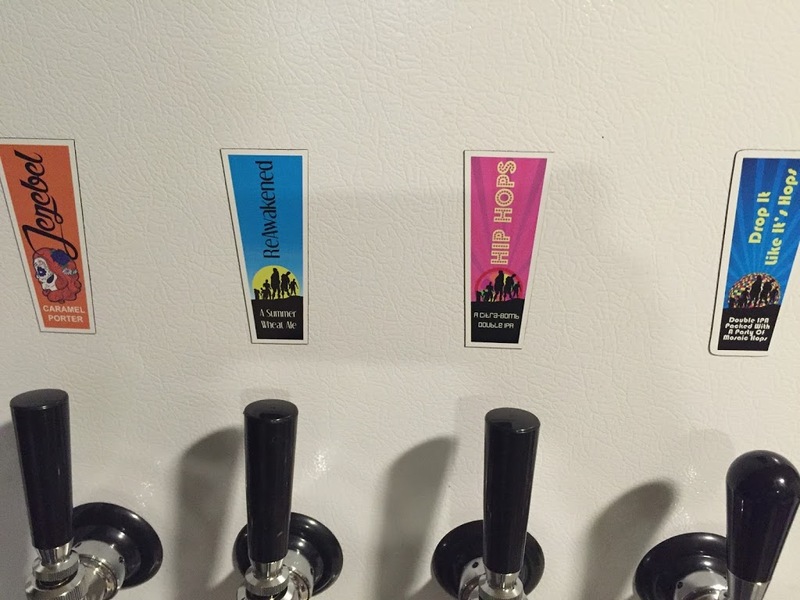 I designed them to mimic the styles of the labels that were created for the beers and they are easy to swap out when the beers change. I ordered the magnets from www.stickeryou.com and they were very reasonable. I ordered five different sheets for the first five brews I knew would be served. Up to the third sheet, the price dropped with every sheet added. The fourth and fifth sheets kept the price-per-sheet the same. As you can tell, I’ve been super happy with their products and the timeliness of their shipping. 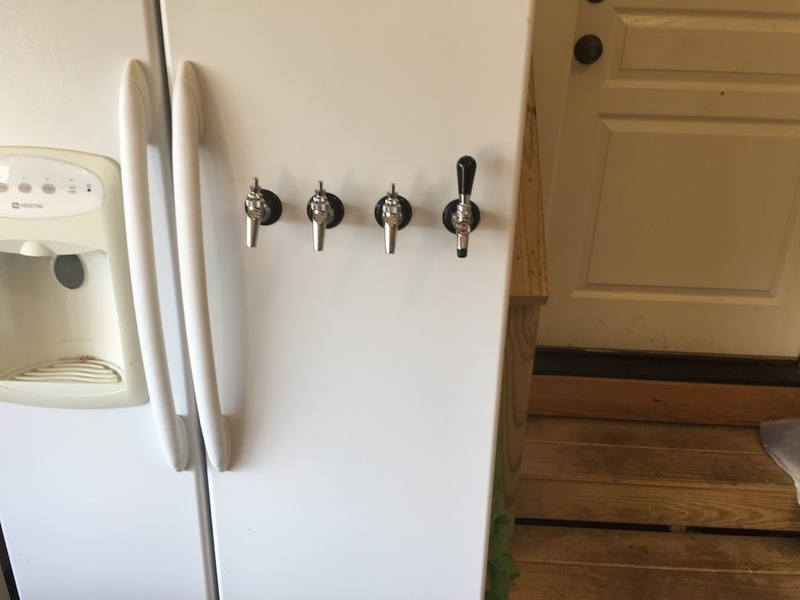 They have done our decals, the large decal for the shed, the decal for the new pump controller and now the kegerator magnets. 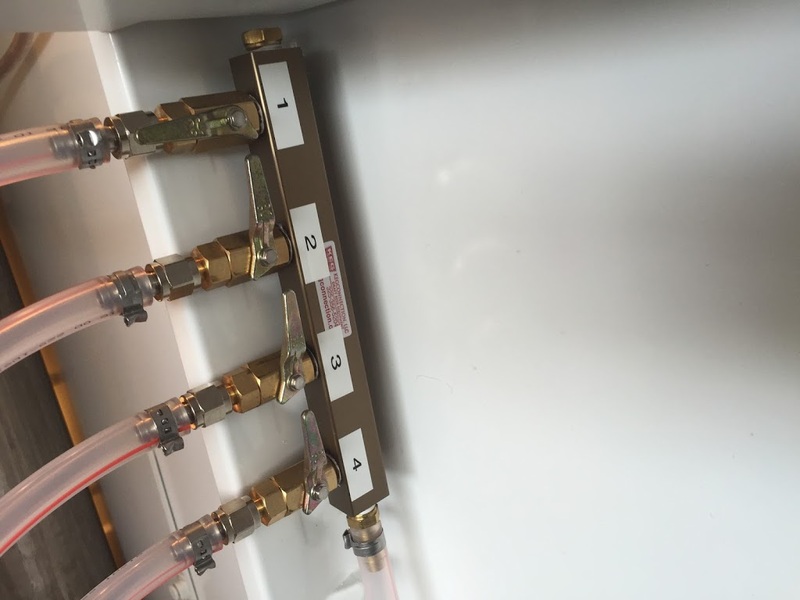 The 4-way manifold with all valves open to dispense from 4 kegs. Time to have a beer and enjoy this latest project to the fullest. Cheers! Thank you for documenting this build. 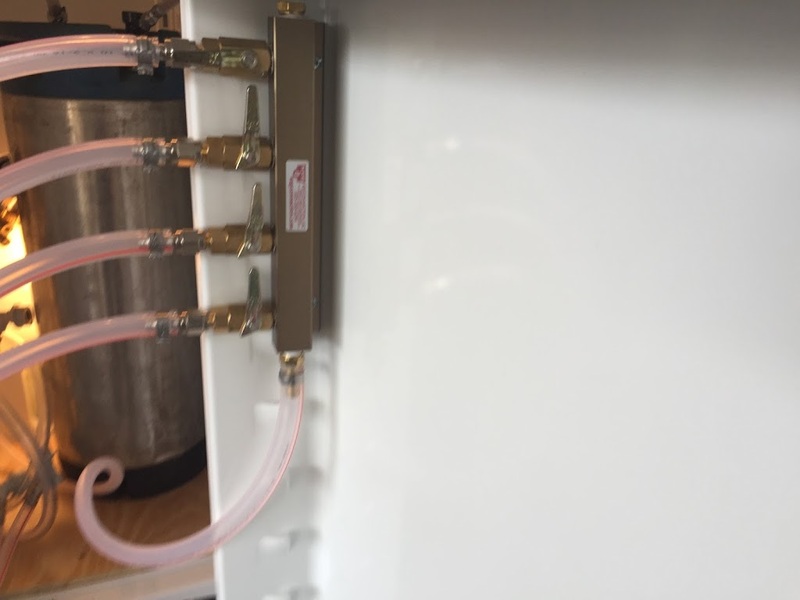 I followed your link from your Keg Connection review as I'm planning a similar 4 faucet build this winter and also have my system specced out there. I've read many of these build project posts and you have mentioned a couple of things I hadn't seen or thought of before. 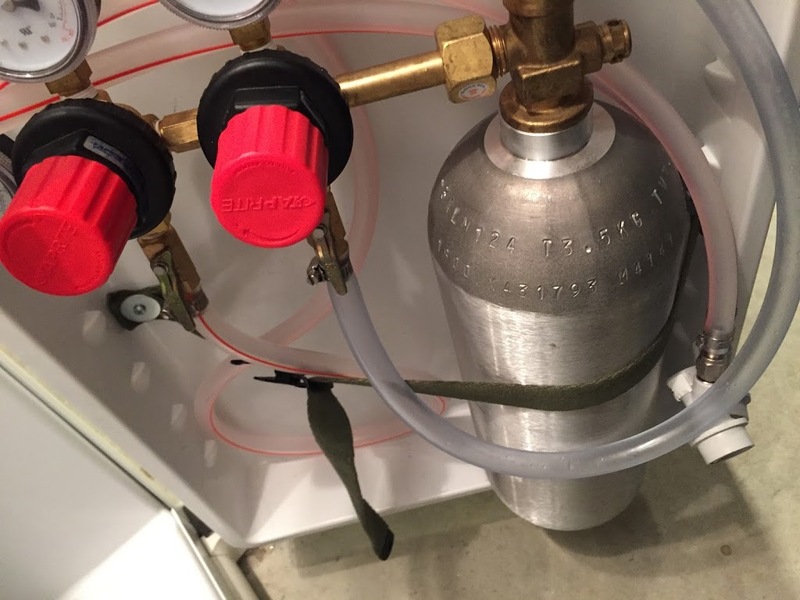 Specifically setting the drip tray height for growler fills and door mounting your CO2 tank. 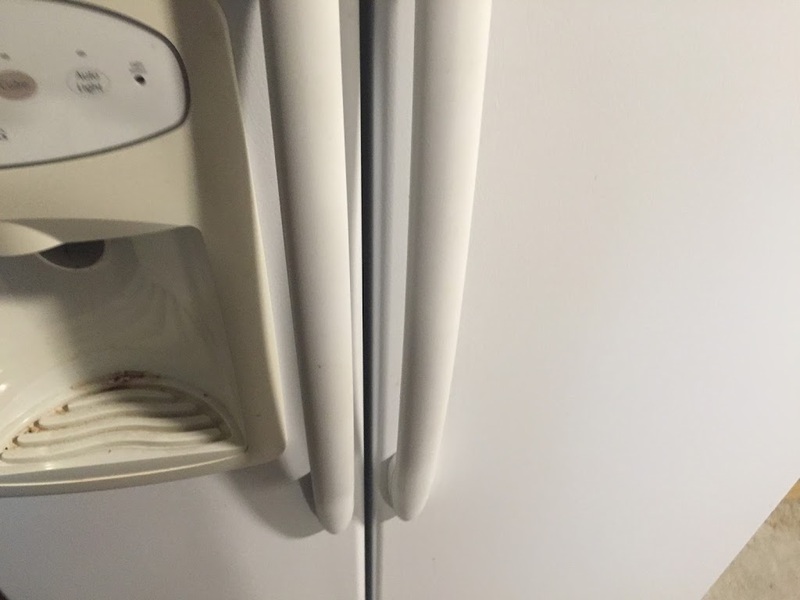 Any temperature control needed on the fridge side? 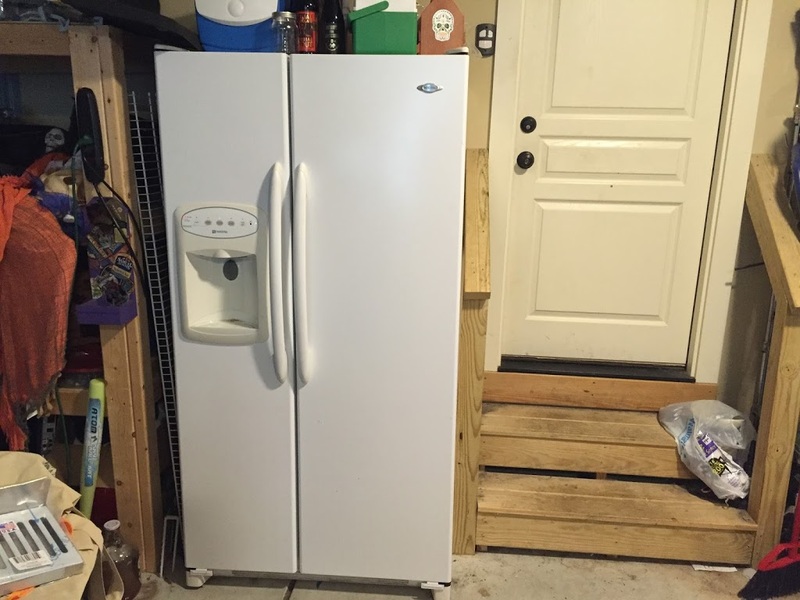 I'd like to keep the freezer working as well while using the fridge side for kegs and beer. I am not using any temperature control at all. 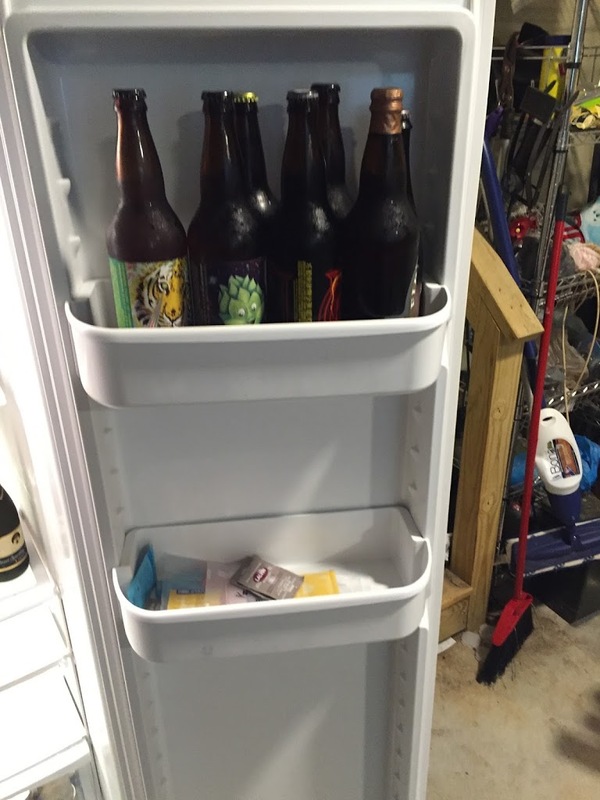 The freezer works perfectly and the fridge keeps all the kegs and bottles cold. 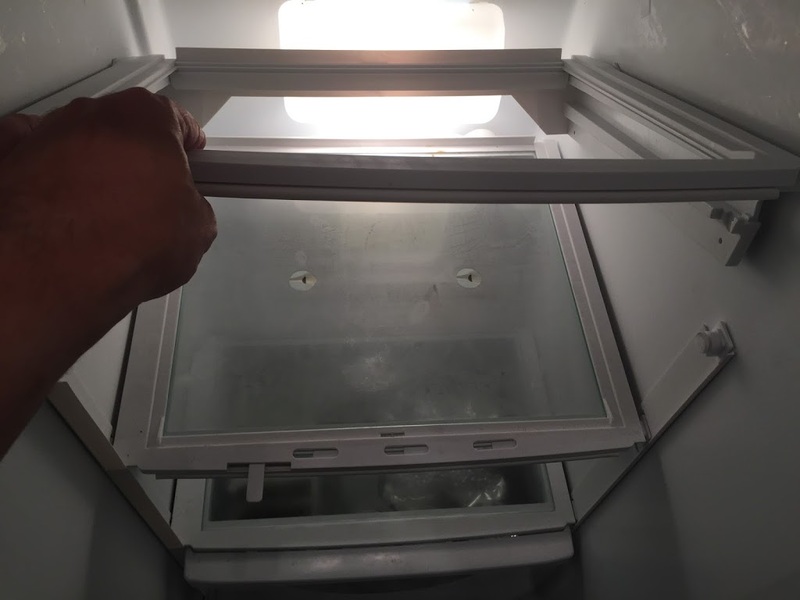 As cold as a normal fridge. I have the internal thermostat turned down, so I keep it ~45 degrees. Great. Thanks for the info. I am wondering what the model # is on your fridge. I think I have the same one in stainless and am thinking of converting. Would be helpful to know if it is the same or larger than yours. Thank you. This is a Maytag Dual Cool Model MSD2651HEW. 26 Cubic Foot Side-By-Side with a fresh food capacity of 15.83 cu.ft.